It’s inspiring to see how other artists set up and use their Art Toolkits. 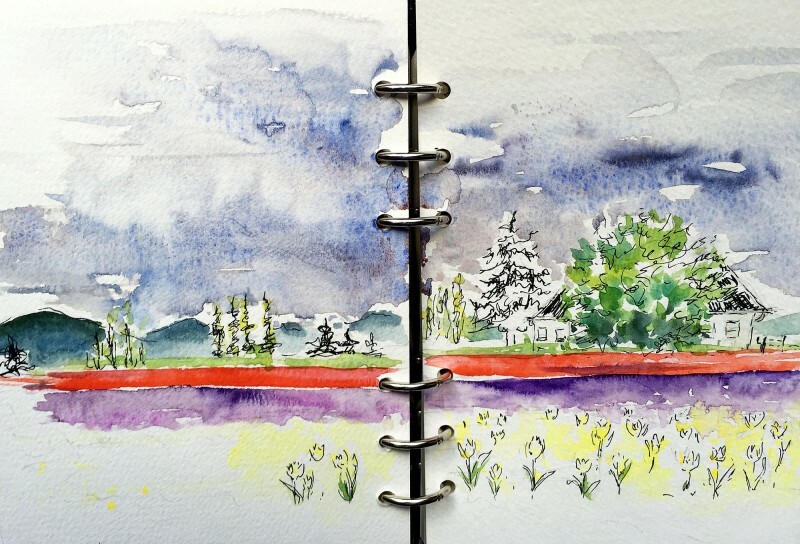 Kathy Dennis lives in Mt Vernon, located in the beautiful Skagit Valley of Washington State, and recently shared some of her sketches with me. 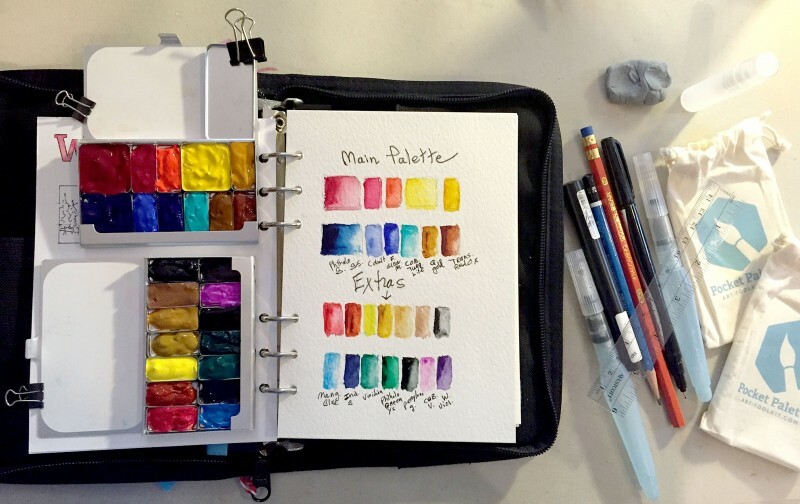 Kathy added an extra waterbrush, pen, pencil, kneaded eraser, and two travel brushes to her kit. She’s also filled two Pocket Palettes with a lovely selection of colors. 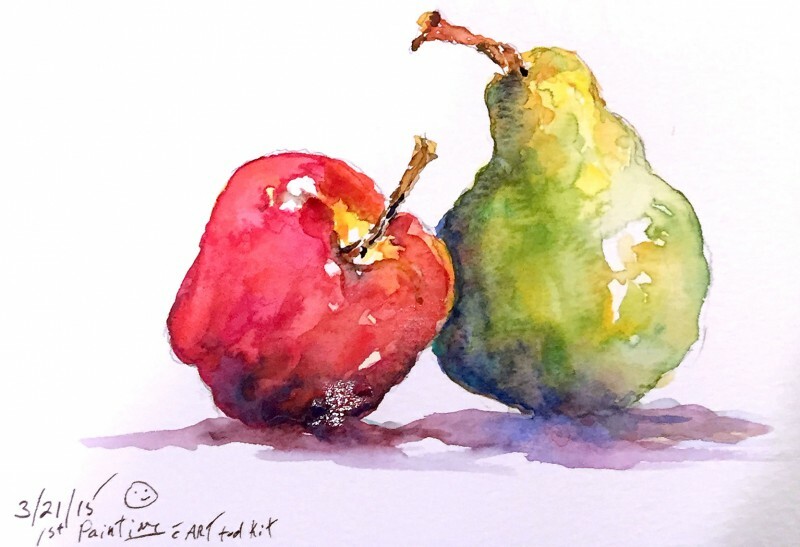 Her main palette includes three jumbo pans for the primary colors (Permanent Alizarin Crimson, Windsor Yellow, Phthalo Blue Green Shade) with some lovely additional options for mixing: Permanent Rose, Vermillion, Indian Yellow, Cobalt, French Ultramarine, Cobalt Turquoise Light, Quinacridone Gold, and Transparent Red Oxide. Her second palette is for “fun extras” and includes Quinacridone Coral, Quinacridone Sienna, Cadmium Lemon Yellow, Nickel Azo Yellow, French Ochre, Bronzite, Lunar Black, Manganese Blue, Indanthrone Blue, Viridian, Phthalo Green Yellow Shade, Perylene Green, Cobalt Violet, and Windsor Violet. Color is so seductive! Special thanks to Kathy for sharing her work! Wax had melted from the Florida heat! I love my new kit with it’s magnetic pans, I take it everywhere. I have already used up all the included paper and am starting on the next pack. Kathy Dennis is an amazing artist! She is also a wonderful saleslady for your kit. I also bought my kit, after talking with Kathy, and used it all summer to sketch with the Anacortes Sketchers group, and Mazatlan. I’ll be taking it with me to Spain and Portugal this year. It’s so handy to have everything in one place, so when the mood strikes, you’re always ready to go painting. I love my kit! I love this watercolor set up besides when I clip the palette on the left I cross my painting to paint. I’m right handed. Am I going about it wrong? Hi Rita, I would experiment with how your clip and orient your palette and pages so it feels good for you! Perhaps turn your sketchbook around so you can clip your palette on the left? :) I often work in the landscape orientation, so my palette is clipped above my paper. Have fun!